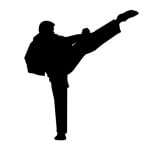 Chief Instructor Shihan Mike Greaves 6th Dan who is fully qualified and C.R.B. checked. This Karate and self defence class is open to all age groups so why not come along, have fun, and take the opportunity to improve your fitness and self confidence.